This is the third coffee we have tried from Hemisphere Coffee Roasters (www.hemispherecoffeeroasters.com) and this one is a dark roast version of the Café Diego. It is described as Nicaraguan coffee at its finest with good acidity and chocolaty undertones. It is grown at high altitudes in old shade canopy. We liked the light/medium roast we had before and thought this would make a good comparison. It has a nice roasted aroma from the bag and the freshly ground beans. Kim said that she could smell the freshly ground beans upstairs. She thought there was almost a fruitlike aroma. Me, I just thought it smelled really good. First up for the brewing was the French Press. The flavor reminded us of bittersweet chocolate and the acidity is mild. There is a natural sweetness as you drink it and a nice, not too tangy aftertaste. It’s a good morning cup of coffee. Next up was the auto-drip and the overall flavor is a little milder here. I want to emphasize that the aroma of these beans is really good. The aroma fills the area where you are grinding and brewing the coffee. Even though there is a good roasted flavor it is not as strong as you would expect from the aroma or the color of the beans. We enjoyed this brew too. Lastly we used the Chemex coffee maker. This was our favorite way to drink this Café Diego dark roast. I never get tired of the clean taste of coffee from the Chemex. You can taste some fruitiness and some dark chocolate. I would describe the aftertaste as pleasant with a mild acidity. The coffee beans were dark, but they were not over roasted. The taste from the Chemex was our favorite this time, though any of the three brewing methods produced an enjoyable cup of coffee. 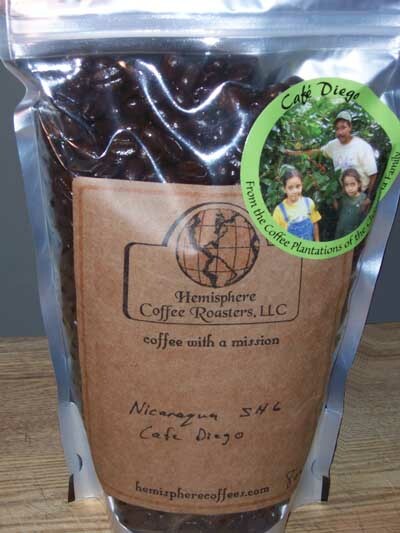 If you are looking for a dark roasted Nicaraguan coffee we suggest you try this Café Diego from Hemisphere Coffee Roasters. We would also encourage you to visit their site and look into how they are helping coffee farmers. They work with Rosedale Mennonite Missions to help indigenous farmers and laborers improve both their lifestyles and communities. You can enjoy their coffee and help people in different parts of the world at the same time. We received this coffee for free and offer objective feedback. Until next time stop and enjoy the coffee and conversation. Since you first shared the story of this roaster, I’ve been hearing more and more about companies that are doing more to help the farmers that grow our “precious” coffee. Hopefully, it’s a trend that continues to grow.